SecureClean Enterprise allows you to find and permanently delete hidden, cached, temporary, and "deleted" company files on a one-time basis, or on a daily or weekly schedule. Employee computers contain hidden, cached, temporary, and "deleted" company files that can put your company at risk without you even knowing it. Most programs keep temporary or cached data and files that can contain company documents, browsing histories, passwords, web images, online banking information, deleted emails, and old instant messages. Even if employees "delete" this data, it can still be recovered using freely-available tools. Not only does this put your company data at risk, but these extra files can cause system bloat and clutter up company computers causing system performance issues. You need a way to securely find and delete this data so it can never be recovered, not just once, but on an ongoing basis. SecureClean Enterprise allows you to find and permanently delete hidden, cached, temporary, and "deleted" company files on a one-time basis, or on a daily or weekly schedule. You'll no longer have to worry about company data being compromised. 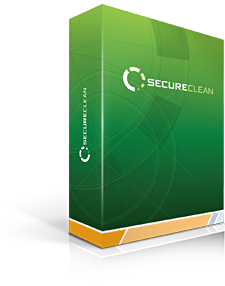 SecureClean uses government-grade wiping technology that ensures your data can NEVER be recovered, even with the most sophisticated tools. By deleting these files, it will not only enhance your company's security and protect against data leaks, but company computers will run more smoothly and keep from bogging down. How Can I Use SecureClean Enterprise? Schedule daily or weekly cleanings to keep your company data secure on an ongoing basis without any additional effort. You can also choose to clean your files upon shutdown or log-off. Bulk licensing is available for corporations or small businesses. Contact one of our sales reps today for a free quote.